Last week I did auction for the Stick Curlers in St.Albert. They were having a tournament and had few auction items at the banquet. Milt (far left) is an old auction client of mine, he was curling in the tournament and was one of the organisers. The table I sat at for dinner had three more past clients and I for one had a great evening visiting with them and making new friends of the others at the table. The guest speaker for the evening was Gold Medal Winner Marc Kennedy. 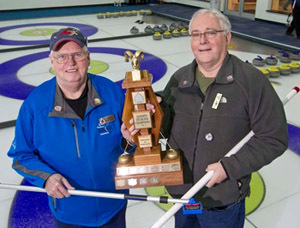 The St.Albert Curling Club is his home turf, so to speak. He talked about being a child and spending family time in that very building, plus of course he talked about being a gold medal winner. Let's just say that the crowd was far more interested in what he had to say than what I had to say, as was I.